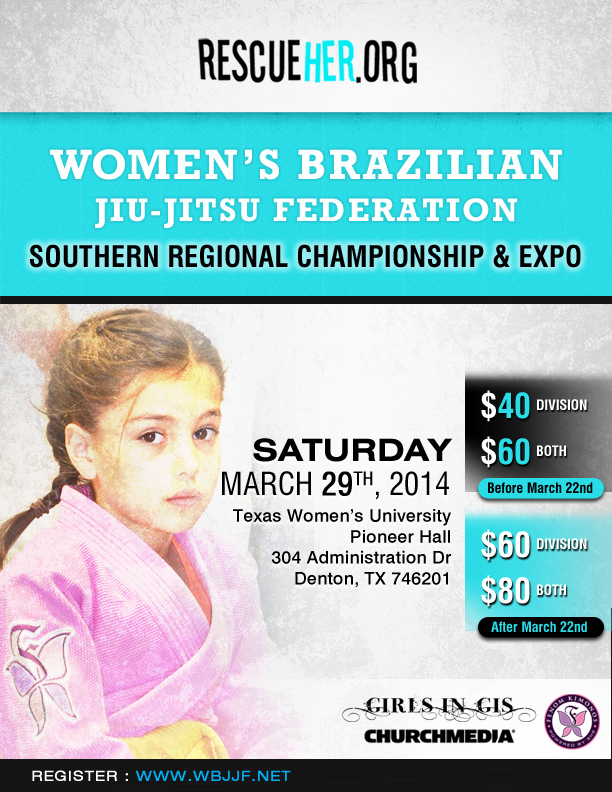 WBJJF is hosting Southern Regional Championship, a womens Brazilian jiu-jitsu tournament, on Saturday, March 29th. This is a no-gi and gi tournament for all ages and experience levels. It is shaping up to be the biggest event of its kind with nearly 100 competitors signed up. The tournament benefits Rescue Her, a charity that fights human trafficking. Human trafficking is the third largest international crime industry behind illegal drugs, and fire arms trafficking, and it generates a staggering 32 billion dollars a year. Approximately 80% of trafficking involves sexual exploitation. It is a modern-day slavery that victimizes children as young as 3 years old. Rescue Her raises money for prevention, intervention, and desperately needed after care both in the US and abroad. Fenom Kimonos is sponsoring the event by providing cash prizes to the expert divisions. Purple, brown, and black belt ladies have a chance to win up to $500.00, depending on how stacked the brackets are. Come out to see the best Texas jiu-jitsu women in action, and support a great charity!